Though your wedding is just one day, you two have taken your whole lives to get to this moment. Your slide show is a compilation of your lives up until this point. It's to be enjoyed and celebrated by all of your family and friends together on this special day! 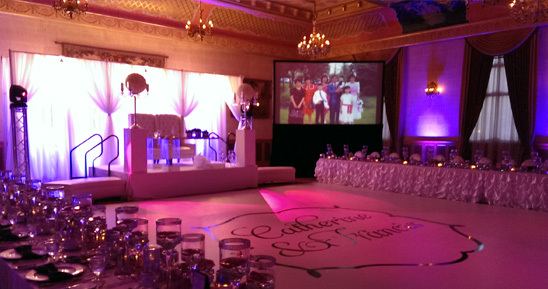 Many times, when planning a wedding, the video projection system is neglected. 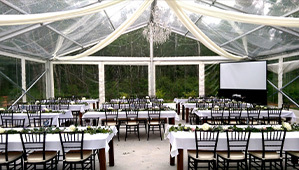 Many times an improper type of projector is borrowed from somebody for the wedding. Many times a small screen or a wall is used to project on to. Many times not everyone can see due to poor screen placement or due to a dull, washed out or blurry image. Let us do it right! We come and set up the appropriate size and type of screen with the proper type of projector at the right height so everyone can see clearly! All of our screens come with black velour skirting and look very classy. Our projectors come on carts with black velour skirts and wheel locks. All cabling gets taped down. If a rear projection screen is used, then all projection equipment is hidden behind the screen and people can walk right in front of the screen without casting shadows. Never worry about compatibility or having the proper video cable. We supply and hook up everything. Just provide your laptop (or other device) with the slideshow/wedding video on it and we'll get everything ready. We use the correct tool for the job. We always have spare projectors, screens & bulbs on hand in case of any surprises. Book in advance and rest easy knowing it will be done right.